Several meticulously researched and insightful books have explored why the United States went to war in Iraq. Works like Thomas E. Ricks’s Fiasco and Barton Gellman’s Angler have thoroughly examined the hubris, confused thinking, and ever-changing rationales for the 2003 Iraq invasion and subsequent occupation, but no one volume has fully captured the day-to-day grind and lethal reality faced by American troops on the ground in Iraq. Until now. Pulitzer Prize winner David Finkel, a Washington Post staff writer, spent over a year with an American infantry battalion, known as the 2-16 (whose average age is 19), as they deployed from Fort Riley in Kansas to one of the most dangerous, war-ravaged areas of Baghdad. Carefully detailing the experiences of the 2-16 and its commanding officer, Lt. Col. Ralph Kauzlarich, Finkel has crafted a wartime account so visceral and so emotionally wrenching that it will leave many readers stunned. Details of the horrific injuries of the four survivors and what the IED had done to kill Cajimat come via the battalion’s doctor: “All four [of Cajimat’s] limbs burned away, bony stumps visible. Superior portion of cranium burned away. Remaining portion of torso severely charred.” Finkel isn’t just interested in how such horrific deaths and injuries impact the battalion, creating a toxic climate of revenge and fear, but also explores their impact on families back home. He shows us burned soldiers recovering Stateside, battling to live with multiple amputations and the resulting mental scars, as family members struggle to maintain hope and find meaning. After a June 8th EFP explosion, one soldier responded brutally: Sergeant Frank Gietz, who killed seven Iraqis during a firefight the next day, tells Finkel that he wonders whether he’d gone too far and overreacted to the previous day’s horror: “It’s a thin line between what we’re calling acceptable and not acceptable…you’re supposed to know when not to cross it. But how do you know? Does the army teach us how to control our emotions? Does the army teach us how to deal with a friend bleeding out in front of you?” In reflections like these, The Good Soldiers makes manifest the daily struggle to make sense of the senseless — little wonder that these young men suffer under the strain. Even the optimistic Kauzlarich struggles with the contradictions of trying to win the hearts and minds of a population containing some who would happily see him and his men incinerated. After Kauzlarich barely survives a May 2007 EFP attack and his convoy limps back to base, he’s momentarily compelled to deal with his own mixed emotions. 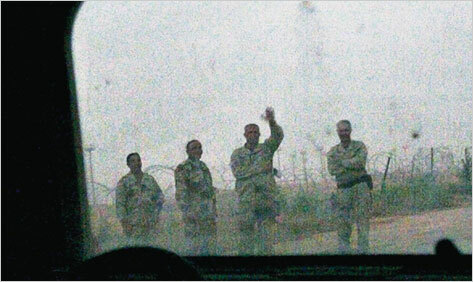 During the drive back, an Iraqi girl with “filthy hair and a filthy face…kept waving at the convoy, and now at Kauzlarich himself, [and] he had a decision to make. He stared out his window. He raised his hand slowly. He waved at the f*cking child.” In such sardonic moments, as soldiers try to smile at the daily horror, readers see the schizophrenia of wartime. As the number of 2-16’s dead and severely injured mounted, both Kauzlarich and his men suffered plummeting morale that would lead to a “countdown” mentality as their deployment ended. The Good Soldiers, in turn, uses the opportunity to explore the disconnect between the home front and the war front, especially how soldiers tuned out the endless political wrangling over the war. Finkel writes at length about the physical and mental scars left behind for the soldiers, and for the families who can’t possibly comprehend what they’ve been through. This shift in focus to the aftermath of war leads to some of the book’s most searing moments, as Kauzlarich visits injured soldiers from his unit in a Texas hospital. The colonel meets one soldier’s young wife and mother at bedside, and then turns to greet a soldier blown up by an EFP: “There was so much of Duncan Crookston missing that he didn’t seem real. He was half of a body propped up in a full-size bed… He couldn’t move because he had nothing left with which to push himself into motion…and he couldn’t speak because of the tracheotomy tube that had been inserted into his throat. Every part of him was taped and bandaged because of burns and infections[. ]”Just days later, Kauzlarich received an email from Crookston’s mother, saying her son had died. In all, 14 members of the 2-16 would be killed in Iraq, and dozens more would find themselves burdened with traumatic injuries and post-traumatic stress. Finkel’s book is so valuable because it moves well beyond the mind-numbing statistics and rarefied political debates to explore the war as it’s actually fought by young people trying to do what’s right amid horror, hopelessness, and grinding fear. The Good Soldiers uniquely portrays the physical and mental toll on these soldiers; there’s unlikely to be a more raw and visceral account of its true nature. Chuck Leddy is a member of the National Book Critics Circle who writes frequently about American history. He reviews books regularly for The Boston Globe, as well as Civil War Times and American History magazines. He is a contributing editor for The Writer magazine.